Photo by Wendy Chan A hearty soup for a family New Year celebration. Chinese New Year is around the corner, falling on Feb. 5 this year. To celebrate the Year of the Golden Pig, my southern Chinese family's tradition is to have savory rice ball soup the night before, whereas the northerners like to have dumplings. The soft little balls made from glutinous rice flour symbolize closeness and affection for family and friends. On New Year's Eve, it is important for families to get together and share a feast — rice ball soup is a must-have dish. 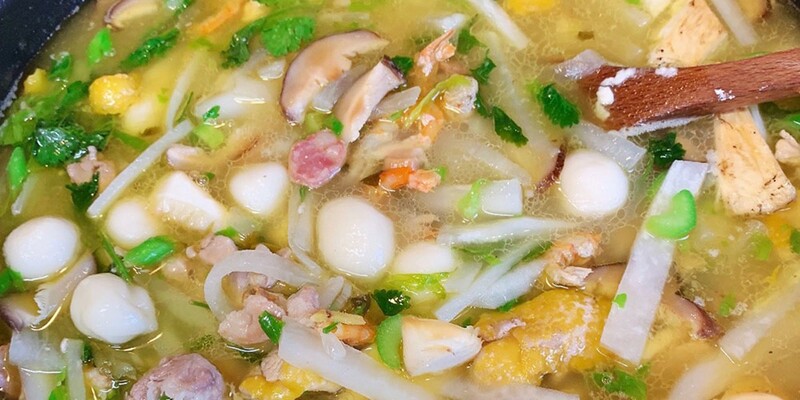 This delicious soup is packed with rice flour dough, meat, dried shrimp, vegetables and herbs. A good broth is the key. A bowl of it brings warmth and comfort to your soul. I often make it during the winter and my kids like to help me. While they are rolling the tiny rice balls, I tell them my Chinese New Year stories from when I was their age. I remember the weather was always harsh during the month of February in the village. One year I was visiting my maternal grandmother. In her tiny kitchen, she was busy making fresh chicken broth in a big pot and cooking meats and vegetables in a large wok. The crackling wood in the fire box of her stove was burning strong. I sat with my youngest aunt and uncle by the fire, competitively rolling the rice balls in our hands. Amid the aroma of the soup and the steaming from the wok — everyone was pacing back and forth to the kitchen, waiting anxiously for this New Year's Eve special. Despite how delicious they were, I didn't care for the rice balls back then. According to my mom, for years I was the only one in the family who chewed them but was afraid to swallow. So I always ended up having steamed rice with the broth. My grandma is turning 97 soon and this year I want to make my recipe when I visit her. I can't say my recipe is traditional but my mom thinks it's close enough to the village style. First, make the broth. Put the bones, ginger and water in a big pot, and bring it to a boil. Reduce the heat slightly and let it boil for 20 minutes, skimming any fat or scum. Turn the heat down to medium-low, cover the pot and let it simmer for at least 2 hours. While the broth is cooking, marinate the pork and chicken with soy sauce, corn starch and 1 teaspoon of oil for 30 minutes. Then get the rice balls rolling. Set aside ¼ cup of rice flour. In a medium bowl, mix the rest of the rice flour with 2 cups lukewarm water and knead it well until it forms a soft dough. If it's too dry, add water 1 teaspoon at a time. Use the reserved flour to dust a cookie tray and your hands. Roll 1 teaspoon of dough into a ball between your palms and place it on the tray. Continue rolling until all the dough is rolled into balls, leaving space between them to avoid sticking together. Prepare the soup. In a wok or a large pan, warm the oil over high heat. 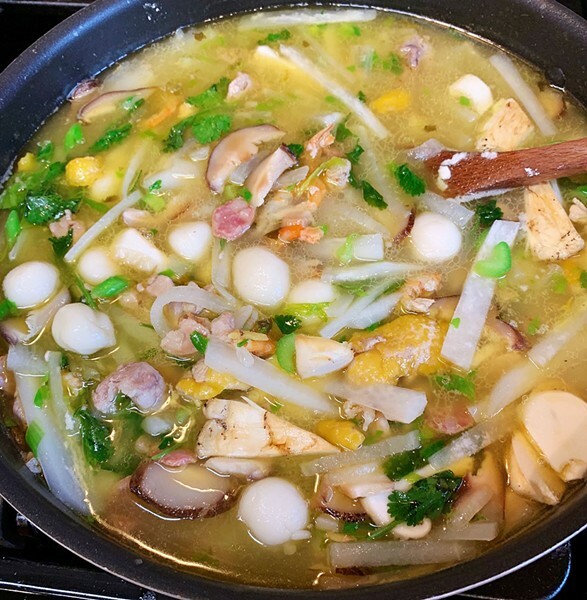 Add the dried shrimp, chicken, pork, sausage and minced ginger, and stir fry until the meat is lightly browned. Add the daikon and shiitake mushrooms. Sauté for 3-5 minutes and add the broth through a strainer. Let the soup boil for 10 minutes until the daikon is tender. While the soup is boiling, add the rice balls, letting them boil until the balls are floating. Remove the pot from heat and add the green onions and cilantro, as well as salt and white pepper to taste. Serve hot. Enjoy Wendy Chan's soup and more at the Chinese New Year Fundraising Lunch benefitting Food for People and the Jefferson Community Center on Feb. 16. Tickets via Eventbrite.